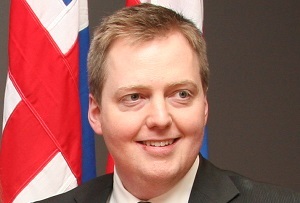 Sigmundur David Gunnlaugsson has been caught up in the Panama Papers scandal. But he's not going anywhere just yet. Iceland’s prime minister stood down yesterday after being linked to the financial scandals published in the so-called ‘Panama Papers’. Except that he didn’t. Instead Signmundur David Gunnlaugsson took a leaf out of the Nigel Farage book of non-resignation resignations. The scandal is an unfortunate blow for a nation that is trying to move on from its spectacular meltdown in the early days of the financial crisis – proportionally the largest collapse of any country's banking sector, ever. Gunnlaugsson rode into office in 2013 on a wave of nationalist rhetoric, after criticising the country’s creditors (which include British and Dutch taxpayers) and the ‘vulture’ hedge funds who picked up the pieces of what was left of its finance industry on the cheap. He hasn't been linked to tax avoidance or corruption, but the news that he and his wife owned an offshore company, Wintris, that was itself a creditor of Iceland (he sold his 50% stake to his wife for a symbolic $1 after entering parliament) was always going to be a red rag for his political opponents. Presumably his plan now is to lay low for a bit until the dust settles. Plans for a snap election appear to have been put on ice - bad news for the country’s anti-establishment Pirate Party, which was on a whopping 46% in a recent opinion poll, despite being founded little more than three years ago. Unlike his Icelandic counterpart, Cameron is unlikely to resign. But should he choose to stand aside perhaps George Eustice, our very own minister for agriculture, would be ready to step up to the plate.